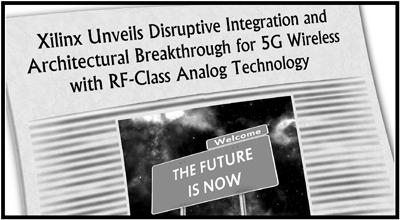 Sign-Up for Quartz Zynq UltraScale+ RFSoC Updates! Documentation is HTML-based and can be viewed from any web browser. This new format started with the Jade family of products and will be used with Quartz and all future products. This new format allows easier access to the complete product documentation set (hardware, software, and IP), with all manuals linked and accessible through the same interface. A powerful search feature helps users quickly find the information they need. The documentation is delivered on DVD, with updates available via our FTP site, so it does not require an internet connection. The AXI4* implementation in the Jade architecture distributes control registers throughout the block diagrams, which is different from a centralized control register memory map. Because of this, the address information must be navigated in a different way than in the past and using an HTML, linkable format puts the register information right at your fingertips. *AXI4 is the fourth generation of an interface specification from ARM® commonly used in the semiconductor industry. Xilinx has adopted this standard to create AXI4-compliant plug-and-play IP. Navigator FDK follows the AXI4 standard. For Pentek's Jade products, the FDK includes the complete IP that is factory-installed in the board. This includes all interface, processing, data formatting, DMA functions, etc. IP designers can modify or replace functions as needed to match application requirements, and will find immediate compatibility with Xilinx IP and third-party IP that uses AXI4. Designers who create their own custom IP using the AXI4 standard will find integration with the Pentek-supplied IP straightforward. 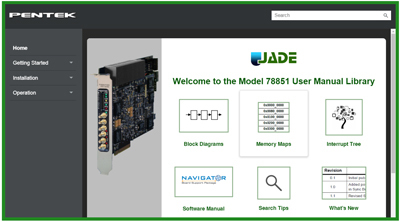 The picture below shows the user manual library for Jade Model 78851. To the left, the table of contents panel lists the HTML manuals: Getting Started, Installation, and Operation. The center of the screen provides easy access to block diagrams, memory maps, the interrupt tree, and the Navigator BSP software manual. Each Jade product is shipped with a DVD containing its user manual library. If you sign up to receive product update notifications via YourPentek, when the library is updated, you'll get an email notification. Clicking on the link in the email will download a short document that describes the user manual library and tells you what has been updated in it (to see an example, click here). The document also contains instructions for how to download a zip file that contains the updated library. We are excited about this new format for our documentation because we believe it will better serve our customers.